Mother Teresa did not spread "Western medicine". Compassion is a property of humans, not of any one religious sect. You'd be more correct to say "Nursing needs to discover its humanist roots", but then that wouldn't be compatible with your need to arrogantly claim compassion as a specifically Christian virtue. Compassion is a property of humans because, as Thomas Sydenham the English Hippocrates recognised, human beings are made in the image of God. But it is a historical fact that modern nursing grew out of a specifically Christian tradition which has now been largely lost. Nursing pioneers were motivated by their love for, and commitment to, Jesus Christ and this is what gave them their compassion for people. 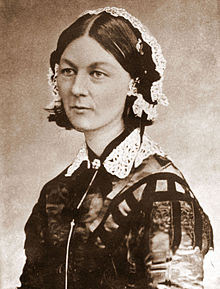 Although Florence Nightingale seems to have believed nursing was her God-given mission, that doesn't mean compassion is something specific to a practising Christian elite and implying otherwise will make a lot of hard-working people very, very angry indeed. I told you what my (atheist) nurse of a daughter thought of your claim. Haven't there been studies which confirm what many already suspected: that those who put religious belief first are in fact less compassionate carers? Mother Theresa, for example, certainly meant well, but her rigid Catholic views meant she withheld from the young women who came to her for help the one thing that would most have protected them: contraception. If you read my post carefully you will see that I say that nursing 'has to be motivated by a worldview which supports (compassion) and many modern nurses do not have such a worldview'. This is actually quite true. I am well aware that other worldviews support compassion and that there are many compassionate nurses who are not Christians. We call that 'common grace'. In the same way there are some 'Christian' nurses who are not compassionate. We call that sin. But it doesn't alter the fact that modern nursing was born in the nineteenth-century, in no small measure due to the work of Christians like Elizabeth Fry and Florence Nightingale, who found their personal motivation in the teaching and example of Jesus Christ. Nightingale actually trained with the German 'Diakonale' or Deaconess movement of the Lutheran church - to this day many of the Scandinavian nursing schools share the same heritage and the word for nurse in most of those languages remains 'diakonale'. Nightingale was certainly motivated and trained in a Christian environment, and that informed her values, ethics and practice, and thus shaped modern nursing. But as Dr Saunders says, that does not mean that people of other faiths or none do not share those values or that compassion. The biggest problem is that the culture of the NHS has become ever more business orientated and moved away from that Christian ethos and human dimension of care. However much individual nurses may want to be compassionate, it seems to me that the very culture of the system (and indeed wider society with its marginalisation of the elderly, the poor and the disabled) mitigates against compassion - look at the recent slew of reports about how we fail to care for our elderly citizens. A call to rediscover those values that informed the modern nursing profession at its beginning should be welcomed. I do not think Mother Teresa was a trained nurse - she was a lay person who tended to the sick and the dying of Calcutta. I have read her biography, there is nothing in it about having a nursing degree. She also did not bring any "western medicine" to India. You might not be aware of this but India has its own very advanced system of medicine which pre-dates western medicine by over 7000 years, and is still in use and very popular. The British borrowed many medicines from us when they were ruling India. Even today some "western medicines" are actually derived from Indian Ayurvedic medicines. Mother Teresa so far as I know did not provide any form of medical care - what she did was look after the dying. Many local doctors of both Western and Indian medical practice used to volunteer their services for her patients, and she accepted. Her patients benefited both form Indian and western medicine. Do not think we need a westerner to teach us about medicine! We are the country that gave the world Susruta, Charaka and many many more medical pioneers. As a surgeon yourself, you must be knowing that Susruta's plastic surgery techniques are still used in your western surgical practice. Of course compassion is very important in healthcare. But I do not know if it is lack of religion that causes the lack of compassion. Unfortunately for many people religion is a separate business from compassion and service to mankind. I say religion, since all religions teach compassion. In case that sounds as if I do not appreciate what Mother Teresa did, let me assure you that I respect and admire her greatly - a truly wonderful and selfless woman. I am not at all surprised that the Catholics have made her into a saint. She was inded a saintly person. She is greatly revered in India by people of all faiths. We do not think of her as a "westerner" but as a great Indian. Thanks Raghu - yes indeed I learnt about Susruta when I was doing my surgical part one. I accept that Mother Teresa was not a nurse and what I have said above about her is not strictly correct as you point out, but as you say she was a woman who served the poor and dying and she was motivated by her Christian faith in so doing.